During pregnancy and the postpartum period our bodies undergo a huge amount of change, growth and pain. With the weight of heavier breasts pulling our shoulders forward, a big tummy shifting our center of gravity, pelvic pressure and changes in our hormones affecting our joint we are often left in a lot of pain and discomfort even before the arrival of baby. Once the baby is here breastfeeding or bottle feeding, constantly holding, rocking or bouncing baby, baby wearing and of course the stress on the body from birth means our posture, back and hips are often left in a really bad state. Strength training you back, rear delts, glutes and hamstrings to improve and strengthen you posture. Minimizing the amount of chest work you do in the gym to avoid over tight muscles which pull the shoulders further forward. Being aware of your posture and trying to often correct yourself when sitting especially. Practicing posture strengthening exercises and stretches often through out the day especially if you work at a desk. Strengthening and keeping the pelvic floor strong. Keeping and looking after the deep core muscles as these help support your back and posture. 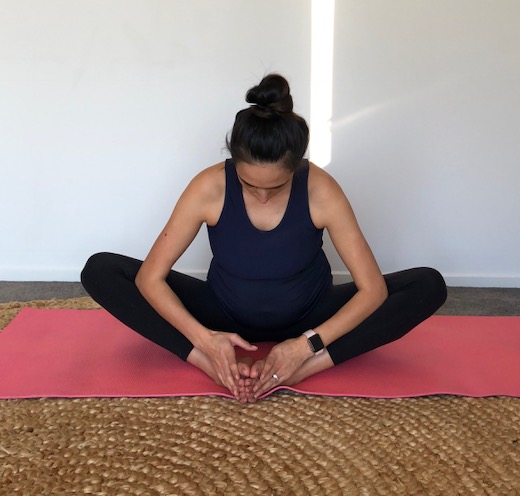 But one of the best ways to keep aches and pains away and help your posture is to stretch and in this article I will show you some great stretches for pregnancy and the post-partum period once you have healed from birth. These stretches will help improve your posture, take pressure of the spine and release the back and hips. I suggest performing these stretches everyday, even twice if you can find the time or choosing a handful to try in the morning and the rest at evening. Make sure your body is nice and warm before performing. Hold each stretch for between 30 seconds up to a minute unless they become to painful then stop take a breather and start again until you reach the minute mark. Repeat them a couple of times if you have the time. One of the most important things to remember when stretching is to breathe, do not hold your breath and take nice deep breaths in and out as you relax into the stretch. stretches your hips and takes the pressure off your lower back/spine. Try to completely relax your body and move your legs as wide or narrow as feels comfortable. Stretches the hip rotators (the buttocks area) and the hip flexors (the long muscles that run along the front of your thighs and pelvis). Try to keep your back leg directly behind your body as opposed to on an angle. Only attempt this after sitting in the normal Pigeon Pose above and if it doesn't put any pressure or stress on your belly. If you cant reach your toes place your hands where comfortable on your legs to feel a slight stretch in your hamstrings and your lower back. This targets your hip adductors, a small muscle in your inner thighs near your groin in opening and closing your legs. Press the insides of your feet together and gently push your knees down with your elbows. Try to interlace your fingers behind you and pull your arms together, lifting the chest and squeezing the shoulder blades together. Provides a gently massage to the spine and belly organs. As you exhale, round your spine toward the ceiling, making sure to keep your shoulders and knees in position. Release your head toward the floor, but don't force your chin to your chest. 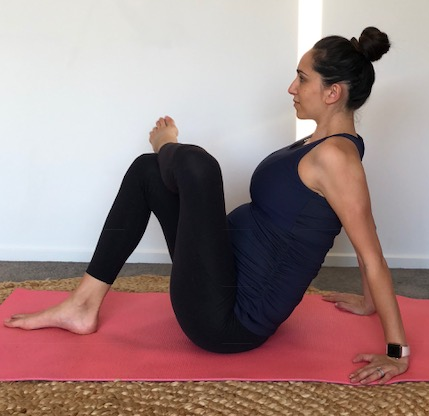 Please note when pregnant this should only be performed with a slight bend in the back and if you have moderate to severe abdominal separation (or it feels uncomfortable at all) please do not perform this stretch. Often paired with the Cat Pose (above) As you inhale, lift your sitting bones and chest toward the ceiling, allowing your belly to sink toward the floor. Lift your head to look straight forward. Cross left ankle over right knee and sit back to allow room for your belly while feeling stretch in your left buttocks. Swap sides. Let your hands fall to the floor and try to completely relax, especially let your head just hang and your neck relax. Have a slight bend in the knees if the stretch is too intense through the hamstrings. This stretches your lower back, hamstrings and if you squeeze your shoulder blades together you can also get a nice stretch along your upper back. Keep your neck neutral. With elbow on a 90 degree angle, place against a wall and slowly move your body away from the wall until you feel a stretch in your chest. Perform on both sides. Gently pull your head towards your elbow until you feel a stretch in your neck. Perform on both sides. For an extra stretch place the other hanging arm behind back. With both elbows at 90 degree angle pull shoulder blades together so your arms move back stretching out the chest while improving the strength of the back posture muscles. Place one hand on your toes or shin as pictured. Slowly lift your upper back and then bend at the waist. Lower your head and trunk toward your right knee, feeling your left obliques stretch. Continue to lower your head to below your right knee. Not only do I find these stretches make me physically feel better and help reduce some pains I also find it really helps to clear my mind and refocus when I take 10-15 minutes to stretch each morning or evening. It's also a great thing to try if you're unwell in your pregnancy and unable to exercise consistently - its such a nice way to gently move the body. I stretch for both my body and mind. You can read more about the benefits of stretching HERE. Of course if you need any help or have any questions please feel free to ask.